Utagawa Kunisada/Toyokuni III (1786-1865) Ehon Gappo Ga Tsuji (An Illustrated Picture Book of the Crossroads of Gappo) c 1850. Oban diptych. 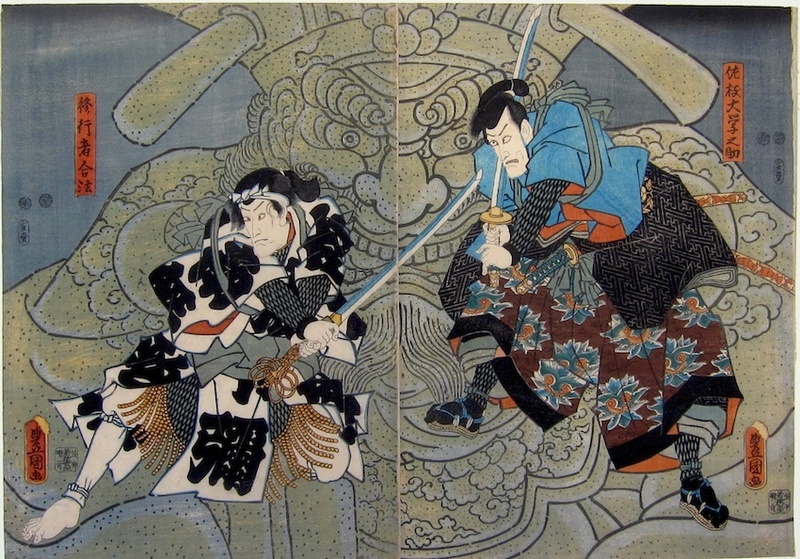 This beautifully preserved diptych by Kunisada depicts what has been described as ‘a kabuki drama of unfettered evil’. Early nineteenth century kabuki was dominated by the writer Tsuruya Nanboku IV who created a genre of plays that revelled in bloodthirsty melodrama. Ehon Gappo Ga Tsuji is an outstanding example of this type of kabuki play sometimes called a Kyogen drama. The plot is concerned with the recovery of a family heirloom and the revenge for a cowardly murder. The scene illustrated by Kunisada is from act six: Myokakuji Omote no Ba (In Front of Myo kaku Temple). We see two actors in the roles of Yaegaki Monzo and Kageyama Shigenojo, fighting before a huge statue of Emma Daio (the King of the underworld); it is an extraordinary, startling image, the grimacing face filling nearly both sheets and the actors depicted mid-fight. The play was performed at the famous Kawarazaki theatre in Edo in 1850. Probably from around 1850, the print is full size, in fine condition with strong colours, and crisp early impression, no condition issues. Unbacked and joined at the seam.